An inquest hearing in Belfast on Tuesday heard how Peter Magowan, who had his own personal protection weapon removed due to mental health concerns, cut the padlock from another officer’s locker in Ballymoney station and removed a gun along with one round of ammunition. The 55-year-old father of two had been suffering from work-related stress and was undergoing a staged return to work – having been treated with anti-depressants and counselling – performing a non-operational office role with reduced working hours. A major incident was declared after the Glock pistol was reported missing on April 18, 2016 and, amidst the ongoing investigative activity in station, the fact that Inspector Magowan was absent from two scheduled meetings initially aroused no suspicion of a possible link. Coroner Paddy McGurgan expressed concern at a delay in briefing CID investigators of a missing officer who had had his own gun removed, that insufficient weight was given “to the fact that only one round of ammunition was taken,” and that the officer who sealed off the locker room was “too focused on preserving evidence” around the theft. Mr McGurgan also recommended that the PSNI should consider making police lockers more secure, and that the storage of officers’ personal protection weapons in the issued Glock lock-boxes “should be compulsory”. An earlier inquest hearing heard how Mr Magowan, who performed a variety of roles since joining the PSNI in 1997, had informed his wife Lisa that he was struggling to cope under the “immense pressure and stress” of work. The inquest heard how the officer, who previously worked in a bank, would sleep for only two and a half hours on a Sunday night if required to work on the Monday. The coroner said he believed Mr Magowan should have been medically assessed “as not fit for work,” and described the failure to make that recommendation as “a lost opportunity”. Mr Magowan was said to have been particularly concerned at the prospect of a reduction in wages to half-pay, and potentially the loss of his job, if he was unable to improve on his level of sickness absence. The previous hearing also heard how Mrs Magowan had sent a text to her husband on the morning of his death but received on reply. She said this was not unusual due to the poor phone signal reception in his office. The coroner expressed further concerns around shortcomings in the sharing of information between GPs and the PSNI’s Occupational Health and Wellbeing unit – and the “inadequate search of the station” which meant Mr Magowan lay undetected in a showering area within the locker room. However, Mr McGurgan concluded that Mr Magowan’s death “was not foreseeable”. 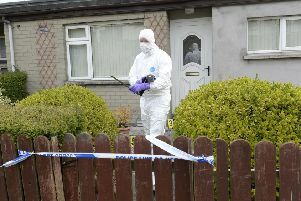 A barrister acting for the PSNI said “lessons will be learned” from the coroner’s findings. Following the inquest, Assistant Chief Constable Alan Todd said: “Today our thoughts are very much with the family, friends and colleagues of Peter as they continue to come to terms with his untimely death. Peter was a highly esteemed and well-respected colleague among officers and staff. ACC Todd said the PSNI would “fully review the information presented over the course of the inquest to identify and implement any further actions as necessary,” and added: “We take our responsibility seriously in supporting our people through the implications and consequences the difficult operating environment of policing sometimes brings. “The best asset we have is our people; we want to invest in them and support them as best we can and as such, we continue to invest in our extensive Occupational Health and Welfare Department to provide comprehensive support measures to support officer and staff well-being”. In a statement, the Magowan family said: “Peter was a fantastic father and husband and he is greatly missed by all of us. “This inquest has been a very difficult process for us. We wish to thank the coroner for the very sensitive way in which he has dealt with this case.